Texsolv AB was founded in 1977 by Sune Ivarsson and they make heddles, cord and tie-up sets for handweaving looms. 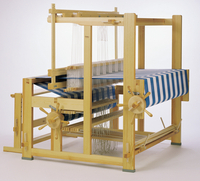 Texsolv heddles and cord are highly regarded by weavers. The heddles are light weight with a wide variety of lengths available to fit most looms. The cord is strong and with equally spaced ‘eyes’ or ‘button holes’ obtaining consistent lengths is a snap. The use of the arrow peg or anchor pin is a further refinement making tie up and use of the cord even easier. 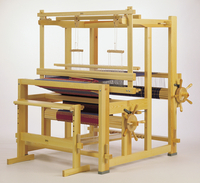 We stock almost every size heddle in use and can supply the appropriate heddle length for your loom. We also stock the cord on spools of 20 meters (22 yds), 50 meters (55 yds) and in boxes of 250 meters. We also have the heavy beam cord, anchor pins and arrow pegs. Below find information on how to use the Texsolv products. Click on Arrow pegs image below for more examples. In the photo at right you can see how an anchor pin and the cord can be used for treadle tie up. The equally spaced ‘button’ holes in the cord make the adjustment not only quick, but accurate and knotless. 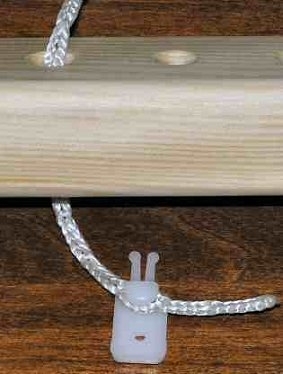 Arrow pegs, the other item used for knotless tie-up, can be used in instances where you attach a cord to itself or to another cord. Both arrow pegs and anchor pins are available in bags of 25. If you clicked on the arrow peg above you saw other examples from Texsolv of how the pegs and pins serve. 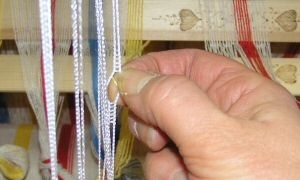 In the photo above you can see the Texsolv heddle in use.